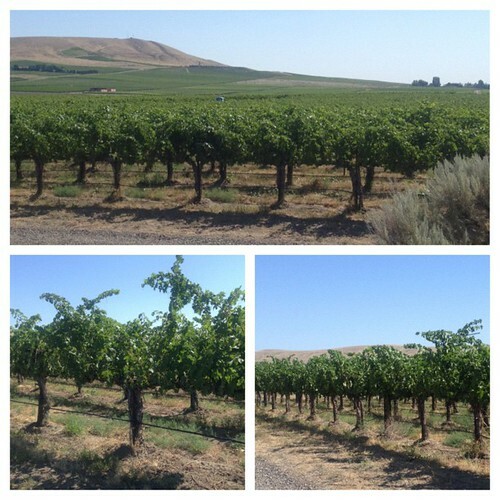 I was an invited guest of Northstar Winery in Walla Walla, along with other wine writers, to learn about Washington Merlot. In fact, I was here for Merlot Camp. So, go ahead, get those “One time at Merlot camp…” jokes out of the way. Done? Good. Because they are pretty serious about Merlot here at Northstar. How serious? We were not afraid to pull over to the side of the road and crowd on the asphalt, traffic be damned, to get a geology lesson from Dr. Kevin Pogue of Whitman College. Oncoming cars did not phase Kevin nor dampen his enthusiasm to show us a thin layer of 13,000 year-old volcanic ash deposited in the soils of Walla Walla. His dedication and fearlessness should not be a surprise if you knew he spent most of the 1990s studying geology in the Himalayan foothills of Pakistan on the Afghan border. 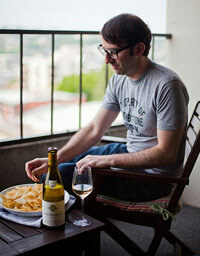 We also spent a lot of time with Northstar Winemaker David “Merf” Merfeld. And, yes, we all call him “Merf.” In fact, I didn’t even know his first name was David until I was doing some additional reading on the winery. Mentored by Jed Steele, a California (and Washington) winemaker, Merf absorbed many lessons from Jed, one of them being always taste as many different wines as you can. And Merf definitely practiced what was preached to him, as we did a comparative Merlot tasting. 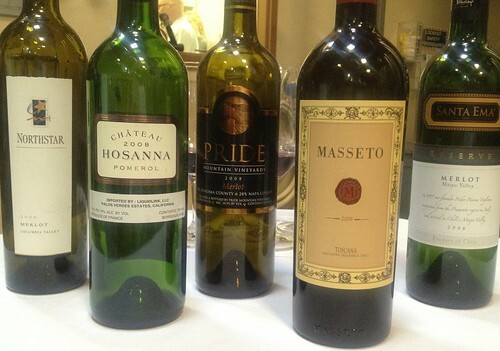 (I have to say I was pretty geeked to taste Masseto for the first time; it’s an ultra-fancy Tuscan Merlot.) What was fascinating about all these Merlots (from Washington, Bordeaux, Napa, Tuscany, and Chile respectively) was how different they were. This was probably due to a combination of Merlot grapes tasting a bit distinct everywhere they’re grown, based on the whims of weather, climate, and soil, as well as the influence of winemakers and what goes on inside the winery. It’s a long journey from vineyard to bottle, but many winemakers feel the wine is best served by having a light footprint on that process. 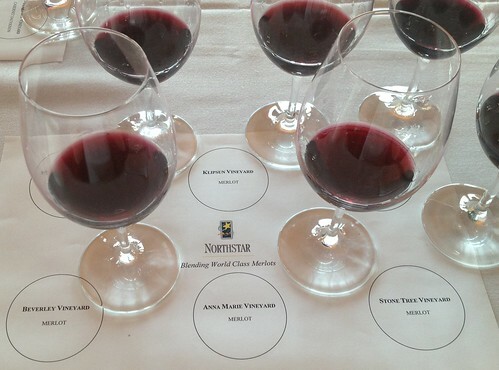 So what are Merf’s thoughts on what each vineyard brings to the Northstar Merlot table? 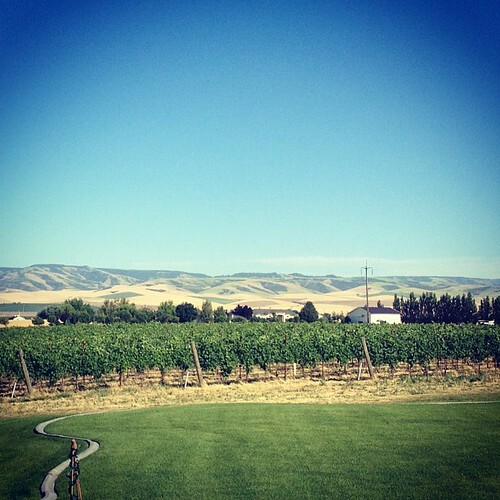 Beverly Vineyard: “It’s almost a complete wine on its own.” And though he doesn’t play favorites with vineyards, he did admit to having a photo of the view from this vineyard as the wallpaper on his phone. Stone Tree Vineyard: “Dark, spicy fruit. Again, would be a complete wine on its own.” He also noted that this wine has a “long finish.” In other words, it’s a wine that lingers. Klipsun Vineyard: Merf refers to fruit from this vineyard as the “backbone of the wine.” It has the most tannin, and plenty of acidity. But there’s more than just Merlot at Northstar. One reason, I believe, is quite practical. You see, it gets very hot in Walla Walla. It was pushing 90 on the day we left and (I hope the people at Northstar will forgive me for saying this) one cannot live on Merlot alone. Merf produces a great Semillon (the 2011 Stella Blanca), full of texture, nice richness, but enough refreshment on the finish to make it a worthy combatant versus a hot Eastern Washington July day. 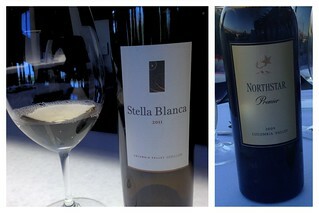 We also got a sneak preview of the 2009 Northstar Premiere, an ultra-premium labor of Merlot love. Look for it in the fall(ish). Though this quick sojourn was Merlot-focused, it was also a great reminder that one of the charms of the wine business is the people and personalities you come across. 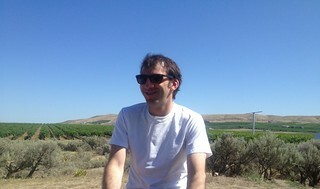 I can’t think of a better ambassador for the distinctness of the grape growing regions in Eastern Washington than Kevin. 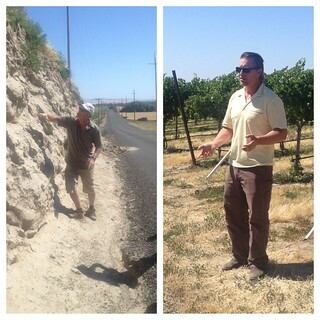 Even if this trip was devoid of winery visits, I still would have really appreciated his geology lessons. (Note to wineries: Don’t take this the wrong way….) And Merf is a laid-back, modest guy who could have a lot to brag about if he ever cared about that sort of thing. So with the combination of people, places, and wine, as well as the lack of bug bites, cruel teenage counselors, and homesickness, this was the kind of camp that made an awkwardly smiling, windblown (and a little sweaty) guy pretty happy. I thought we were sworn to secrecy about those rituals. I hope you were able to make it to Le Pichet; glad you took Shannon’s suggestion to visit the Tasting Room in Post Alley. Thank you for the kudos and cheers!